Intrigued? Then indulge yourself in this brief insight into Edward John Chipperfield - 'The Porthill Sniper' - His WW1 Escapade. In addition to the above, Staffordshire Smallbore Rifle Association is delighted to have received a selection of photographs relating to Edward John Chipperfield, which detail his involvement within the sport of smallbore rifle shooting in Staffordshire. To view a selection of the photographs, which includes photographs of various awards presented to Mr. Chipperfield, please visit the Edward John Chipperfield - A Selection of Photographs webpage. The City of Stoke Rifle and Pistol Club have done it again, with another superb haul of medals in the Staffordshire Smallbore Rifle Association - Air Section - Individual Air Pistol Leagues - Winter 2018/2019. To view the photographs of the medal presentations, please visit the Archived SSRA Air Section - Individual Air Pistol League webpage. The NSRA (660) Inter-County Air Rifle League 2018/2019 - Division 3 - Rounds 2, 3 and 4 - Staffordshire County Team Results are now available to view online. The NSRA (660) Inter-County Air Rifle League 2018/2019 - Division 3 - Round 1 - Staffordshire County Team Results are now available to view online. The next SSRA Committee Meeting will take place on Sunday 21st July 2019, commencing at 11:00am prompt. The venue being The Chipperfield Ranges, Baldwin's Gate, Newcastle-under-Lyme, Staffordshire, ST5 5EA. For full details see the Events Calendar. If you would like to purchase one of these very desirable badges, please visit the News webpage for full details. The above photographic montage shows a selection of Staffordshire County Association Medals, and a ceramic Staffordshire Rifle Association Centenary Mug. It's time for another trip down Memory Lane, as we unearth a few items of interest from days gone-bye. Just what are the items pictured above, and what is their relevance to the Staffordshire Smallbore Rifle Association? The two images of medals shown at the bottom of the montage, as shown above, are of two new additions to the collection. All can now be revealed by visiting the Medals and Memorabilia section of the website. The above photograph shows the ceramic plaque which was presented in 1985 by Staffordshire Smallbore Rifle Association to Major (Retired) Peter Martin, MBE. Staffordshire Smallbore Rifle Association is calling on the good folks of Staffordshire to help solve the significance of the ceramic plaque, as is pictured above. 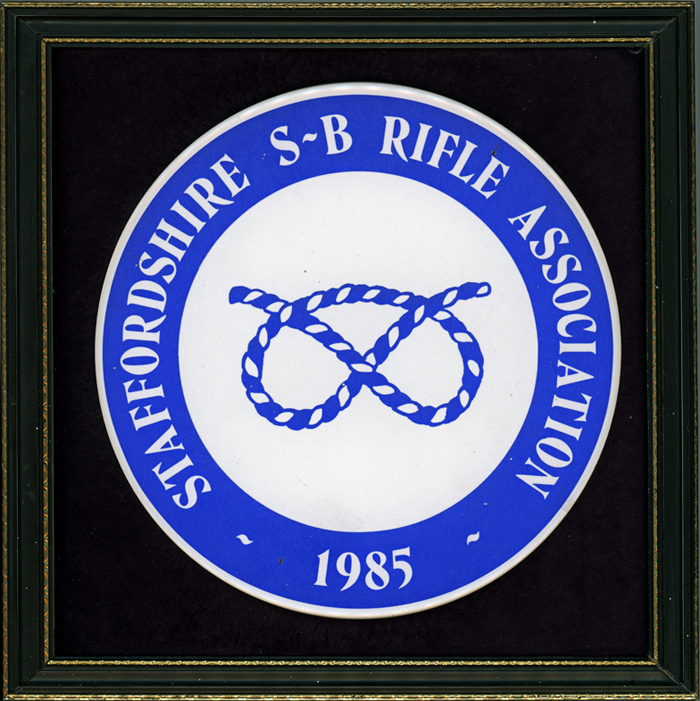 The white ceramic plaque is approximately 15.25cm in diameter and decorated in a blue overlay, depicting the emblem of the Staffordshire Smallbore Rifle Association, along with the year 1985. The plaque is mounted on a dark velour background, which sits within a black wooden frame edged with gold coloured highlights. The overall size of the frame is approximately 20cm square. SSRA understands that the plaque was presented to Major (Retired) Peter Martin, MBE in 1985, but the reason for the presentation is somewhat unclear. Therefore, any help in unraveling this mystery would be greatly appreciated. If you have any further information regarding the plaque and it's significance, please contact the Website Manager. The Weather Forecast Panel, shown below, shows the expected weather conditions for the locality around the area of the Chipperfield Ranges. Although the location shown on the panel may not be exactly the precise location of the ranges, it represents the nearest available weather data for the surrounding area. In this section of the website, Clubs which are affiliated to the Staffordshire Smallbore Rifle Association may submit a brief item of news, which will then be considered for inclusion on the SSRA website. If your Club has any potentially newsworthy items (other than the usual club-specific day-to-day items) that you may wish to be considered, then please contact the SSRA Website Manager. Visit the News page of this website for more information about RSS feeds.